We are fortunate to live close to what is considered by many to be the best beach in Britain – Rhossili Bay on the Gower Peninsula. We have a weekend bolt-hole in the dunes at one end of the beach and head down there as often as possible for some fresh air, relaxation and of course, to sample the local fayre. A few weeks ago I bumped into Estelle from Estelle’s Gower Goodies at the produce fair which is held regularly in Llangennigth Village Hall. 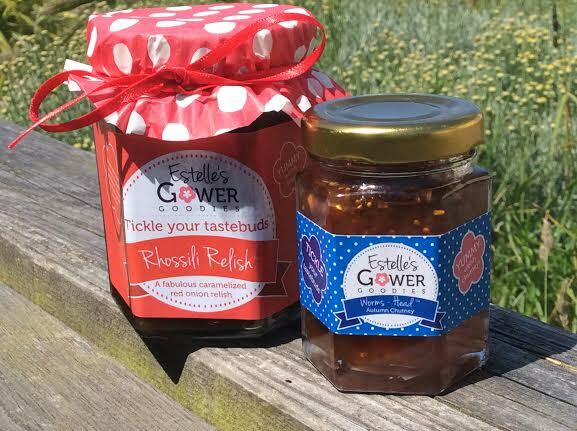 Along with some mighty fine cheese from Pant Mawr and some delicious onion bhajees and a Chicken Biryani from Goggi’s Cuisine, we also brought home some of Estelle’s delicious Rhossili Relish and Worm’s Head Autumn Chutney. The Rhossili Relish is made from deliciously sweet, caramelised red onion and has a bit of a sting in the tail to boot, thanks to the addition of chilli flakes. It was the perfect accompaniment to some homemade cheese scones the other afternoon, and is also absolutely delicious with cold meats and cheese. It makes a ploughman’s lunch really special. The Worm’s Head Autumn Chutney is equally delicious – with almost a mincemeat-like flavour – made from Gower-grown apples. 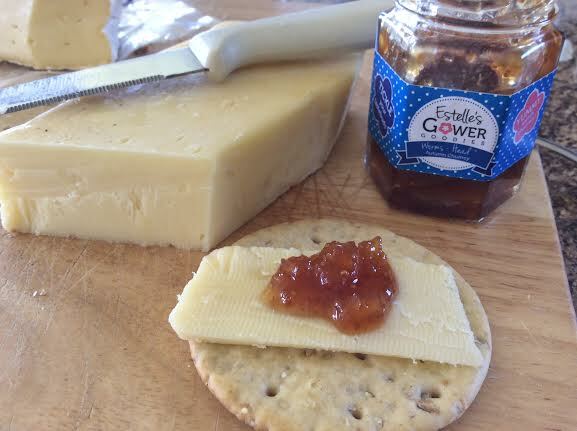 It was stunningly good with a bit of Pant Mawr Caws Preseli and some homemade multi-grain bread or a nice bit of Cheddar and some crisp wholewheat crackers. 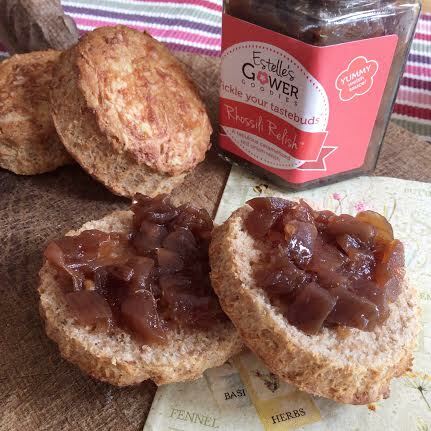 In addition to her wonderful chutneys and relishes, Estelle also makes a whole range of preserves and sauces which she sells locally on the Gower and also from her on-line shop. She is also a rather good photographer and sells some beautiful photographic greeting cards on her produce stall, and has four stunning canvas prints on her on-line shop. All the edible produce is made using fresh unprocessed fruit and vegetables, without using lots of extra additives – which makes them as natural as possible. Why not take a look at the shop and try them for yourself?